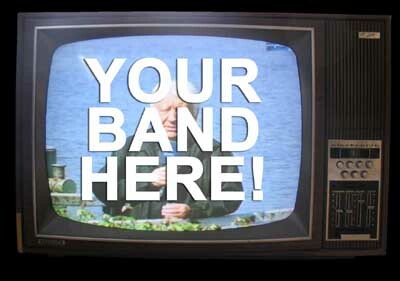 Astonishing ANBAD Competition: Get Your Band’s Music On A TV Advert! Sometimes an opportunity so stupidly brilliant and so hopelessly simple pokes you in the eye and demands your attention. That doesn’t regularly* happen here on ANBAD, but today is truly the exception. So slacken off those eagerly-clenched-in-anticipation buttocks and think about this: A New Band A Day is hosting a genuinely huge competition that gives new bands – yes, like your tasteful C86 Jangle-Pop band, your best friend’s oh-so-now Hypnagogic Pop group, or even your deeply annoying younger brother’s Donk posse – a chance to get their music on a huge, colourful and expensive Crown Paints TV advert. and, excitingly, you’ll have the ear of James Endeacott, who pulled The Libertines and The Strokes up by their skinny leather bootstraps. And all you need to do enter is submit an mp3 by email or Soundcloud. It’s that easy. Click here, submit your song, and brace yourself for the glory days you’ve always hoped for deserved. Go on – it’ll take two minutes, and at the very least it’ll give you something to daydream about next time you’re stuck in a smelly Transit van, in a traffic jam by Junction 15 on the M6, pressed up against the drum kit, after playing to one man and his proverbial dog in Kidderminster. You can thank me later. But I will hound you for my 10% finder’s fee. Posted on October 11, 2010 by Joe Sparrow. This entry was posted in Featured, Featured Articles, Headline and tagged competition. Bookmark the permalink.